Often a thermos is often called that, it just seems that these poor quality fakes, not holding temperature, and just immiteret appearance thermos, and most of them, just no deep vacuum between the walls of the thermos. The history of the flask is connected with the two brands Thermos and Stanley. Thermos was the first who invented and began to produce glass Cup, and the second of Stanley is a well known fact that before anyone figured out how to do the thermos unbreakable steel. Steel thermoses, more reliable and durable. 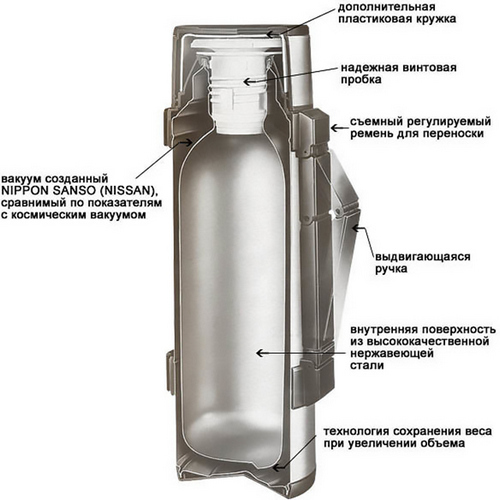 A thermos is essentially a bulb that has the inner part and the outer wall of the housing. And thermos is “bulb”, which is between the flask and the wall of the housing, no air. Ie there is a vacuum. The absence of air prevents the transmission of temperature from the inside bulb to the outside, and from outside to inside. How deep a vacuum between the walls, so it is better to have the thermos insulation. Try to prevent the transfer of temperature between the bulb and the outer wall using a variety of materials and coatings. Tiger thermoses, for example, optionally in a vacuum placed a layer of copper foil, which further prevents the transmission of thermal radiation, which passes through the vacuum. Each manufacturer has their own “secret technology” for insulation, which he did not disclose. Therefore, the choice of thermos, it is better to rely on objective reviews, tests and of course the age of the brand. There is a small list of world-famous brands of thermoses, which have gained popularity because of its quality, the approach to technology and design. And of course, thanks to the main point: the test of time! Other brands on the market large number of these new emerging products, which have their own positive and negative sides. But so far none of them failed in their characteristics and results of tests and number of positive customer reviews to get closer to the top four – Thermos, Stanley, Tiger, Zojirushi. An interesting feature most of the leading brands from the “Japanese.” Thermos in 1989 began to produce together with Japanese thermos brand thermos Nissan(Nippon Sanso), and in honor of this is in the range of a few thermoses so called “Thermos Nissan”. Tiger is a family – run Japanese company, started manufacturing vacuum flasks since 1923. A wide range of products from thermochromic and thermoses to slow cookers and cookware. Zojirushi is a Japanese manufacturer of vacuum flasks since 1948. And only mark Stanley, appeared in 1915 in the United States, remained “American stamp” on this day. Although the production in 2002 was moved to China. Of course, under special supervision by the headquarters in Seattle (Washington state). Most thermoses are made in China, and it’s not bad! Now all the big firms – any from the construction kits to mobile phones and TVs, are harvested/produced in China. Yes, there are “Bad” but there are “Good China” and “Brand China”. It all depends on the level and control of quality norms that are embedded in the workplace. Of course all of the above brand leaders thermos — Thermos, Stanley, Tiger, Zojirushi is manufactured in China for its unique technology and very reverent approach to quality. Maintaining the temperature of the thermos. This question is difficult to quickly navigate, as each model has its own specific characteristics and conditions described in the attached instructions. The greater the volume of the thermos, the longer it keeps the temperature. If you are interested in longer time of heat insulation of the thermos and the dimensions are not important – take a thermos flask with a volume of 1.5 l and above. Keep the temperature of the day! When a manufacturer says that a thermos keeps the temperature 24 hours, this does not mean that temperature is, for example, coffee will be the same through the day. For example, according to European rules “hot” is if in 12 hours the temperature of the contents of the thermos fell from 100°C to 70°C, and by American standards are allowed for 12 hours to 50°C. Of course, it is better to look at those more specific promises that are written in the manual for each model. 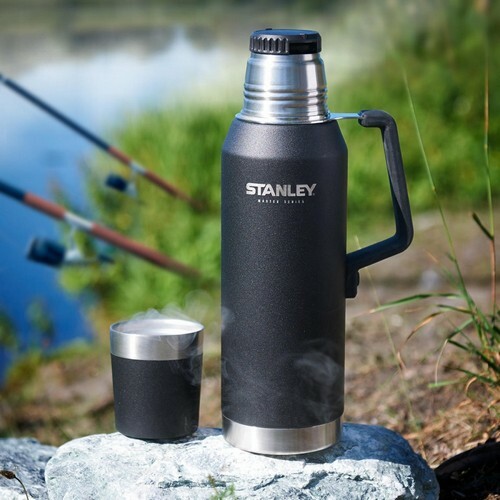 Stanley Master 1.3 l — keep warm: 40 hours / keeps cold: 35 h or 160 hours frozen contents. * It is important to remember that these terms differ from each other really is insignificant. The trouble is, common standards for this. And given temperature, for example, is valid for Stanley at the same temperature of the ambient air, and Tiger in the other. And comparative tests give a negligible difference of 3-5°C. Decide what kind of activities you need a thermos? When you buy thermos, do not forget to check with the seller what kind of insulation is used in the required model. Choose only those models that use vacuum insulation – other options are not thermoses. Check the flask for cracks, stains, etc., Pour the liquid into the thermos, close and invert the flask should not leak. A similar experiment repeat with the boiling water. Pour into a thermos of boiling water (with the thermos), and wait 3-5 minutes. If the outside heats up thermos, then the thermos is rejected. Except a thermometer to check how the temperature changes the content of the thermos, you can not. But worth a try! Theromos rinse with boiling water. Close and let stand 2-3 minutes. So you heat the flask inside. Drain the boiling water and gently pour your favorite tea or coffee in a thermos. And then try the coffee if you it’s still hot – so this is a great thermos! None of the thermoses you can’t reheat in the microwave. The exceptions are some cold boxes for Lunches, which have inside a ceramic or plastic containers. These inserts are specifically designed for leak-proof transportation of food and heating in a microwave oven.